DesktopsWhy buy new, when you can get much more for your money in quality and performance? Our professionally refurbished desktop and tower PC’s are fully tested, loaded and ready to go. These business grade machines are built with higher quality components, designed to last. We also have a wide range of options and accessories to help you, feed your tech! All machines are in excellent condition, and perfect for any home, student or business. Can’t find what you’re after? Ask us to find you the perfect solution! Laptops / TabletsWhy buy new, when you can get much more for your money in quality and performance? Our professionally refurbished laptops are fully tested, loaded and ready to go. These business grade machines are built with higher quality components, designed to last. We also have a wide range of options and accessories to help you, feed your tech! All machines are in excellent condition, and perfect for any home, student or business. Can’t find what you’re after? Ask us to find you the perfect solution! AccessoriesIf you’re in the market for a nice new keyboard and mouse, or simply need some peripherals for your refurbished computer purchase, you’re in the right place. We have a wide range of great quality, refurbished computer accessories that have gone through our strict quality control process, backed by a warranty you can trust. Computer PartsIf your system is broken, or you just want to give your existing computer an upgrade, we have the parts you’ll be looking for. If you can’t find what you’re after, be sure to contact us as we have access to many more parts not listed on our website. DesktopsWe cater for all computing needs, and we know sometimes our budgets can be stretched enough as it is. So why not look at a professionally refurbished computer? Our systems are fully tested and loaded with great free programs to get you started. We also offer great upgrades to make your new machine even better, click here to check them out! Laptops & TabletsWe cater for all computing needs, and we know sometimes our budgets can be stretched enough as it is. So why not look at a professionally refurbished laptop? Our systems are fully tested and loaded with great free programs to get you started. We also offer great upgrades to make your new machine even better, click here to check them out! AccessoriesIf you’re in the market for a nice new keyboard and mouse, or simply need some peripherals for your refurbished computer purchase, you’re in the right place. We have a wide range of great quality, refurbished computer accessories that have gone through our strict quality control. Computer PartsIf your system is broken, or you just want to give your existing computer an upgrade, we have the parts you’ll be looking for. If you can’t find what you’re after, be sure to contact us and we will do our best to help. Or 10 Interest free payments from $24.70 What's this? This is a fantastic ready-to-run Desktop PC ideal for any home, student or office. Being a Business Grade machine it was built with much higher quality, robust parts. These are designed to last and will often far outperform cheap new computers. 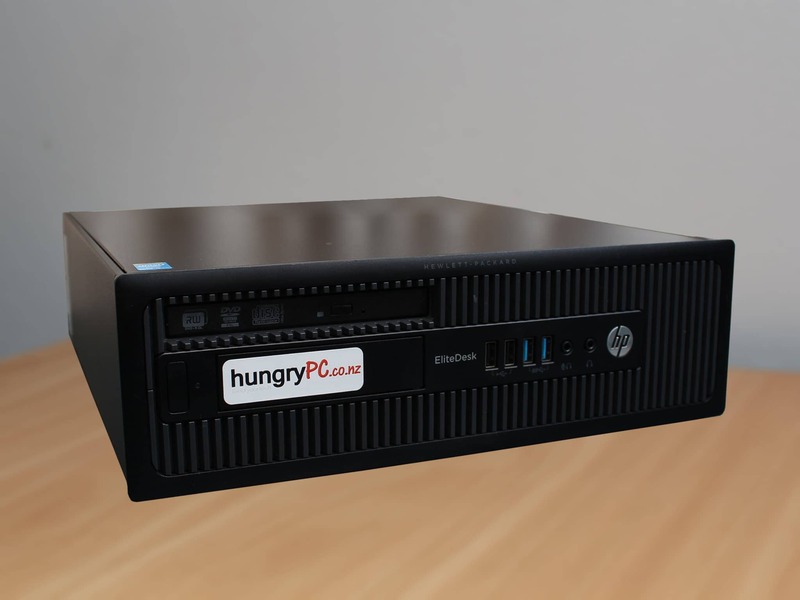 Spend less and get a better machine with hungryPC. Runs just like new and great cosmetic condition. We fully wipe, service, clean & test each individual machine. Any worn components have been replaced or upgraded to give it plenty of life. Genuine Microsoft Windows 10 Pro is freshly installed and activated with all latest drivers and updates. We can even load 32/64bit, Windows 7, or Linux, at no extra charge. If you do not wish to make any changes, simply scroll down and "Add to Cart" for our standard configuration. This is a really nice machine with a modern design that is sure to look good in any home or office. With USB 3.0 and a fast processor that has Radeon Graphics, you can’t go wrong. Compatible Office suite loaded, make and edit any Microsoft Office, Word, Excel & PowerPoint files. Google Chrome, Skype, VLC, PDF Reader, and Antivirus is loaded to get you started. FREE BONUS: HDMI & Wireless (WiFi) Adapters Included! Ready for Wired & Wireless, Fibre or Broadband Internet! We’ve fully refurbished this machine after coming off lease, from use in a corporate environment. As these businesses demand reliability they have been taken care of and maintained to a high standard throughout their life. Being a refurbished product, these are individually checked and thoroughly tested. Often refurbished machines have a much lower failure rate than brand new products, since new machines are not usually individually tested. It is very rare for our customers to have issues and we find these will perform as good, if not better than when brand new. Buying refurbished not only saves you a lot of money, by getting you a better machine at a lower price, it also supports a sustainable environment and reduces landfill, which we think is awesome! Fast friendly service, best deal I found on a little desktop PC, thx!! Excellent Service from Mike and the Hungry PC group. I am very pleased with my laptop as it works exactly what I want to. Computer arrived yesterday. Perfect as described and it does everything hubby needs it to – thank you! The communication, and support was first-class and i want to recommend this team to anyone who wants reliable and truly understanding and helpful support. You can’t get better! Thanks Hungry PC Team! I got a custom pc from your shop, really good communication and a very very nice PC! Thank You! We have just bought our 4th refurbished computer from hungryPC and found them all to be very satisfactory. Mike has been very helpful with what few teething problems we have encountered. Excellent service at very competitive price. Excellent trader.Mike gave me detailed help when needed. Was exactly what I needed thank you, is very fast! Great service. Great product. Really helpful to customize our pc. The kids love it. Great service, product, and details from hungryPC. A pleasure to buy his quality computer hard drives, and clear directions concerning payment and pick up leave us feeling well looked after. Great trade, excellent comms and service. Even accommodated my after sale upgrades. Many thanks for the Free laptop bag too. Much appreciated! Delivered exactly what was requested: A great value second hand computer. Would definitely recommend and buy again! Excellent cost-effective machine at keen price. Very well organized seller who is prepared to go the extramile for customer satisfaction. Bought a similar unit from hungryPC for my daughter and will not hesitate to deal yet again. Very happy with my pc, runs like a dream…and the price was great too! Great to have a very fast computer. Thank you. Excellent deal and great service. Recommend big time. Computer is amazing works better than I expected great communcation fast friendly, hassle free recommend to all others. Good price,good service.I am a returning customer and will be back when the need arises. Need something different? We can customize a machine to suit your needs. Contact us with your requirements. 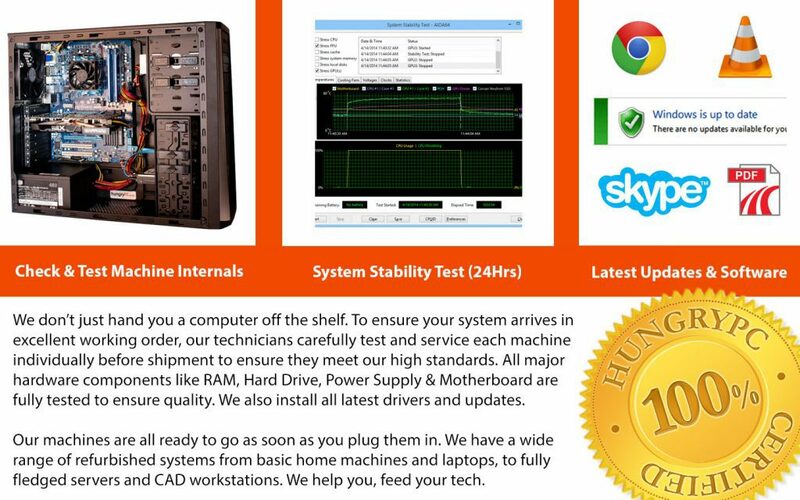 With hungryPC you get NZ's BEST QUALITY, Refurbished & Ex-Lease Computers at incredible prices, backed with warranty and service that is second to none. As an online store we have super low overheads, to give you the best price possible. You can find full details on the Warranty by clicking here. Our online store is specialized in delivering high quality and thoroughly tested, customizable computers all over NZ. We supply anything from cheap home desktops and student laptops to fully decked out office and gaming tower PC’s, with Layby and credit options available. If you’re on the hunt for something specific, we also do customized quotes to provide the best solution. We source used, high-end business grade IT equipment then fully service it all, inside and out, refurbishing, upgrading and testing along the way to provide you an unbeatable machine at an incredible price. These machines perform much better than most new models at a similar price point, with hungryPC you get more for your money. Copyright © 2019 hungryPC. All Rights Reserved. Proudly 100% New Zealand Owned. Hosted by Hungry Hosting.